One Chicago school uses 'Civilization III' to teach history lessons. In the middle of the school day, in room 317 of Chicago's Roosevelt High School last month, freshman Pablo Salas took a break from playing the game "Civilization III" to explain what happened when he told his parents he was signing up for a history class that involved playing video games. "They told me, 'Stop lying. You're grounded.' "
Pablo's punishment didn't last long, because he was telling the truth. In September, he and more than two dozen other students signed up to take an experimental World Civilizations history class, in which text books have been replaced with video games. The class centers on the 2001 strategy game "Civilization III," which tasks players to build a civilization from scratch, by laying roads, building cities, developing culture, exploring the world and fighting battles. It's certainly an easier game for a parent to swallow than a "Grand Theft Auto" title or "50 Cent: Bulletproof." The World Civilizations class is part of Roosevelt High's monthly Student Development Day, in which students are freed from reading, writing and arithmetic and get to take lessons in subjects as disparate as ballroom dancing, nature, rapping, Shakespeare, Iraq and pet care. The day provides a regular bit of horizon-broadening that inspired history teachers and "Civilization" players Tim Meegan and Jim McIntosh to introduce gaming to the school curriculum. Why are some gamers leaving their girlfriends for Mario, encouraged to play in class and getting a crash course in race relations? Watch Overdrive to find out. "I think one of the things video games provide students is a sense of an immediate reward," Meegan said. He wanted to tap into that. "I want to use it as a tool for them to discover more about what really happened and who these people really are," he explained. Meegan said the game can help illuminate such concepts as guns vs. butter, supply and demand, and the pros and cons of military strength. For the first half-hour of the October class at Roosevelt High, the teachers gave a lecture on how some of the activities in "Civilization" relate to the stuff of standard history textbooks. After that, the 29 students took their seats in front of PCs loaded with "Civilization III." They played for over an hour, conquering and being conquered and occasionally even exploring the game's peaceful options. As he steered his Roman legions to attack his computer-controlled neighbors, sophomore David Cortez recalled his first impressions of the class. "Why on earth are they making us play games?" he remembered thinking. "I thought we were supposed to be learning something, not just playing video games." Some students were focusing on building trade routes. "We have to protect our resources," said Salas. "We have to manage with what we got and what we don't got." But most were jumping to conquest. Cortez proclaimed that he wanted to "massacre them all." His Romans had recently broken an alliance with the Americans. "That's the easiest thing to grasp first in this game," said McIntosh. "I think as they get more experience with the complexities of the game they're still going to have the war, but they'll see that there's other ways to win the game." Meegan said he prefers to focus on developing world cultures and improving his people's lot through scientific research. "Yeah," Meegan said. "He likes to kill them all." Games tend to be viewed more as intellectual junk food than something nutritious, but the movement for video games in schools has been on the rise. Much of it is springing from teachers like Meegan and McIntosh, who have been gamers themselves. Deborah Briggs, director of marketing for Firaxis, the makers of the "Civilization" games, said she receives about one letter a week from teachers interested in using her company's games in schools. Some of the growth can be seen on the blog of Bill MacKenty (MacKenty.org), a teacher at the K-8 Edgartown School, who has pushed for games as teaching tools in his schools. Among other projects, he's experimented with using an MIT-developed mod of the role-playing-game "Neverwinter Nights" called "Revolution" that replaces its fantasy setting with a digital version of colonial Williamsburg. The blog Silversprite (Silversprite.blogspot.com) also tracks the development of gaming in schools from North Dakota to England. The students in the Chicago class said that playing games has already helped them in school. Freshman Jonathan Schuldt, for example, said he figured out the answer to a test question about irrigation because he remembered the term from a game. In fact, he now thinks that games should phase books out altogether — and he's not just saying that because his mother works for Chicago gamemaker Midway. "Books get boring," he said. "Games you can play for hours on end." Schuldt wasn't the only student to suggest that games might draw them into lessons better than books, but junior Ilsey Martinez raised her hand to object. "I think that books are better," she said. "You're looking at the game, you're so focused on what you're going to do next you don't capture whatever information is in there." Meegan sides with books, not surprisingly, but he said it would be foolish to ignore games' allure. "If I tell my students to take your 30 pounds of books home and read these pages, 75 percent of them aren't going to take that home and read it," said Meegan. "But if I can tap into their fondness for video games they're going to learn a whole lot more." Up next, he'd like his students to create timelines of their civilizations and even link up for multiplayer in order to learn a bit about how cultures can interact. Both teachers said they would like to get gaming integrated into their full-time curriculum as soon as next year. Nick Fortugno teaches a class in video game design at Parsons. Traditionalists in both education and the video game industry pooh-pooh the trend, calling it a bald bid by colleges to cash in on a fad. But others believe that video games - which already rival movie tickets in sales - are poised to become one of the dominant media of the new century. "But if you just look at the surface of people playing games, you are missing the point, which is that games are all about managing and manipulating information," Mr. Kerrey said. "A lot of students that come out of this program may not go to work for Electronic Arts. They may go to Wall Street. Because to me, there is no significant difference - except for clothing preference - between people who are making games and people who are manipulating huge database systems to try to figure out where the markets are headed. It's largely the same skill set, the critical thinking. Games are becoming a major part of our lives, and there is actually good news in that." But at bellwether Electronic Arts, employment has almost doubled since 2000, to roughly 6,450. Over the same period, the number of employees in Electronic Arts's creative operations - the people who actually make games - has almost tripled, to 4,300. Miami, Honolulu, San Diego, Mexico City. What do these places have that Kansas City doesn’t? Besides warmer winters, they are some of the cities where you can find the innovative entertainment complexes known as Dave & Buster’s. On Nov. 9 Kansas City is joining the pack. The 49th Dave & Buster’s location will hold its grand opening at the new Legends Mall in Kansas City, Kan.Dave & Buster’s General Manager Greg Jackson calls it a one-stop shop. The destination is unique because it combines an arcade, an upscale restaurant, a sports bar and a music venue.“A lot of couples will go to dinner and a movie, but here they can come, have dinner, play games, and never have to leave until we close the doors,” said Jackson.But why Kansas City, Kan.? The site is in the still sparsely developed area near the Kansas Speedway, and Jackson has been asked why they are opening the business “in the middle of nowhere.” Until the rest of Legends Mall opens in the spring, the cinema and Dave & Buster’s will be the only attractions.“The area is growing,” Jackson said. “It continues to grow, and it’s only a matter of time before the residential comes here.” He also mentioned the 300-acre Schlitterbahn water park scheduled to be built nearby in two years and the possibility of a NASCAR hall of fame.Jackson believes there’s nothing else like Dave & Buster’s in Kansas City. The company describes its dining as contemporary American. The Million Dollar Midway has arcade games and electronic attractions. The Kansas City location will have the most up-to-date games. There is a patio overlooking turn one of the speedway, and the rooftop deck is the largest of any Dave & Buster’s anywhere. Starting in the spring they will host live music on the deck. The establishment has more than 40 plasma TVs. The party and meeting spaces can host groups of 12 to 2000. But best of all, they have skeeball.Jackson has been with the company since 1994 and has helped establish the franchise in Philadelphia, Chicago, Denver, Omaha, and several Southern California locations, but he plans to make Kansas City his final destination.“There’s too much continued growth not to stay in Kansas City,” he said. “I’ll be happy to stop moving.”The new business means 315 new jobs for KCK and a boost for the local economy from people visiting from surrounding areas. Jackson and his staff interviewed around 1200 people for positions at the venue. He now has a full staff but is always looking for more good people.A sneak preview was shown Nov. 4, and on Nov. 8, an invitation-only VIP party was held. Dave & Buster’s is paring with Harvesters to raise funds by giving 1000 tickets to the event. 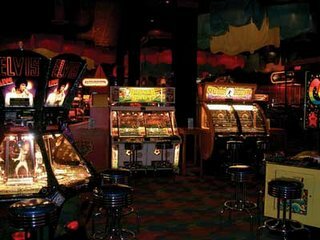 All proceeds will go to the charity.The story of Dave & Buster’s began in the ’70s, when Dave Corriveau ran a restaurant next door to Buster Corley’s arcade and pub. They watched customers go back and forth between the establishments for so long that they decided to combine forces and open a place that had everything. The first one opened in Dallas in 1982.Now the people of Kansas City can check out the franchise themselves. “We want to provide Kansas City with good times and great service,” Jackson said. And though it doesn’t happen often, KCK is getting something before New York City. The Dave & Buster’s in Times Square doesn’t open for several more months. (U-WIRE) MUNCIE, Ind. -- Video games aren't just for fun anymore. The expanding genre of serious games can effectively help to train workers in some of the nation's most important industries including defense, education, health care and marketing. Ben Sawyer is the cofounder of the Serious Games Initiative and the Games for Health Project. The initiatives work to expand on the technologies of game design and explore serious applications for games. "The goal was to build a platform that could serve to promote the idea that there were tools within the computer game industry that could be applied outside the entertainment domain," Sawyer said. There are three main sectors which Sawyer said are showing a lot of growth and promise this year: Defense, health care and education. "In the military space, there's a lot of promise," Sawyer said. "I think they're only a few more years from making games a pervasive part of the way they train." Education and health care industries show more room for growth, he said. The military, however, has proved to be one of the more successful role models when it comes to creating serious games. As well as using games as training tools, the military has also used games as marketing tools. "I'm really enthused by some of the military stuff that I've seen, like 'America's Army' I think has done a fantastic job building a new advertising and marketing model for the Army," Sawyer said, "I think some of the work has been really interesting." One of the Army's more popular serious games, which has experienced a lot of success, is the military marketing tool "America's Army." The game, originally playable on PC on the Army's Web site, is now available for Xbox, as of Tuesday, and will be playable on Playstation 2 in January, according to Ubisoft executive producer Tony Van. The game was a joint effort between game developers and the Army. "Our goal was to embrace the Army brand values, and create a new type of game for the crowded military market," Van said. Sawyer said in addition to getting a new entertainment game for consoles, Ubisoft and the Army have also expanded on their success with serious games by making the move to consoles. "I think the taxpayers are getting a great deal for their money," Sawyer said, "Essentially the taxpayers funded the PC version." Ubisoft feels that the transfer of a serious PC game to console will go off without a hitch. The company also denies accusations that the game is a recruiting tool. "'America's Army: Rise of a Soldier' is a mainstream console game, and not a recruiting tool," Van said, "Ubisoft created a product to not only stand next to its other military games, but to compete against all the posers out there." Sawyer said despite the success of games like "America's Army," the misconception in the field is that games will work as training tools just because they are games. "The misconception is thinking that everything that works in traditional gaming translates to games that are going to work for training," Sawyer said, "We're a long way off from seeing such automatic transfer." It doesn't always work out so well, though. As in any genre, there are always flops, Sawyer said. "There's a lot of really interesting things we can do with these technologies," Sawyer said, "That doesn't necessarily mean we're building the next 'Super Mario.' ... We just have to keep exploring what this new type of game development really is and what works and what doesn't." MUMBAI: MTV US announces its first ever, GameØRZ Week. where video games will takeover its various on-air and online platforms during the week of 20 November 2005. This week of special programming dedicated to the world of video games will highlight the hottest in video game culture via gaming themed programming across MTV, MTV2, mtvU, mtvU Über, MTV.com, and MTV Overdrive. The programming will focus on the latest hardware, hottest new games, behind the scenes access into gaming development, the stars behind the games, the lifestyle, the fiercest competitions, and much more. Featuring Painkiller as the primary game for the competitors, the CPL World Tour finals television special will give viewers an inside look at the journey to the finals, a recap of the World Tour, the game play, and culminate with the winner going home with a grand prize of $150,000. Another special on MTV is called True life: I’m a Professional Gamer. This features three young professional gamers who are challenging themselves and their teams to play and win major pro tournaments around the world. MTV follows them as they balance their lives with their desired careers as professional video gamers. This Sims Life is an investigation into the real stories of people who live part of their lives in this world and part in another world, a virtual reality fantasy world, called the Sims. These people all have unique stories of how playing the SIMS affects their life in and out of the game. This tale about hope and dreams and empowerment will give the audience a behind the scenes look at this world, its denizens and their creators. In addition to the on-air special that will run on both MTV and MTV2, shorts from the show and bonus content will also be featured on Overdrive. Viewers can also check out Direct Effect on MTV for a freak peak look into the video game world. All week long Direct Effect will give viewers at home a unique look into some of the hottest video games around like; NBA Live '06, L.A. Rush, Ultimate Spiderman, Mario Kart DS, Need for Speed: Most Wanted, Def Jam Fight for NY and many more. Theer wil also be celebrity guest appearances, top gamer tips, exclusive game trailers and soundtracks, gaming news and lots of giveaways. Another show Gaming As Homework profiles high-school students who are being taught in a thoroughly modern way. MTV News goes to one high school class where text books have been replaced with video games. Civilisation is fair game but what about Halo? In Gaming Cost Me My Girlfriend MTV News heads to Kansas State, where the school has recognised the student club: "Girlfriends Against Video Games" and students say that excessive gaming is often the number one issue in relationships. MTV has partnered with the professional gaming firm Cyberathlete Professional League (CPL), to cover the fast growing, international sport of computer game competitions. MTV Overdrive, the new broadband video channel from MTV.com, will be featuring CPL player introductions and profiles, the world standings, and providing live coverage of the CPL World Tour semi-finals from the web2zone cyber center in New York City. The MTV Overdrive webcast will be powered by TsN, Team Sportscast Network. The CPL Final Match will take place on 22 November 2005 from the Nokia Theatre in Times Square and will be aired live on MTV Overdrive and MTV 44 1/2. In addition, MTV will feature highlights of the tournament and create a half-hour special of the World Tour Finals. MTV News will be featuring game related news programming all throughout GameØRZ Week including: While the anonymity of online gaming can be liberating, it can also create a forum that allows for the sharing of extremely racist views. MTV News talks to gamers who have turned away from online gaming because of the abuse that they have suffered, and meet a group of non-white gamers who have gathered together to fight back. one. It's also the subject of occasional controversy. For some, it becomes a life-consuming obsession. Starting Tuesday, gaming morphs once again when Xbox 360, Microsoft's new home video-game console, debuts worldwide. The console, which costs $299 to $399, is a home multimedia hub that plays music, streams video and connects to the Web for immersive, interactive entertainment. So if you're inclined to dismiss gaming as an adolescent boys' fascination, resist that temptation. Today we have profiles of Utah gamers that may surprise you. Sega Sammy Holdings Inc., a company formed from a merger between a game-maker and a pinball maker, reported a net profit of 25 billion yen (US$210 million) for the half-year through September. Sales for the six-month period ended Sept. 30 totaled 248.6 billion yen ($2 billion), Sega Sammy Holdings Inc. said in a statement. There were no comparative numbers for the previous year's fiscal half profit or sales because Sega, which makes Sonic the Hedgehog games, and Sammy, a pinball manufacturer, merged to form Sega Sammy Holdings Inc. in October last year. But the company did forecast that earnings for the full fiscal year through March would rise 12 percent to 56 billion yen ($470 million) profit on 567 billion yen ($4.8 billion) sales.